The survey is designed to determine the public’s knowledge about rip currents and the effectiveness of the current warning signs in use at surf beaches around the country. The survey was developed by Dr. Chris Houser of Texas A&M University (TAMU) and Dr. Rob Brander of the University of New South Wales with support from the Texas Sea Grant College Program. “The results of this survey will be used to determine whether our current efforts are visible, memorable and can be understood by beach users, or whether we need to rethink how to warn beach users of the rip danger before they enter the water. 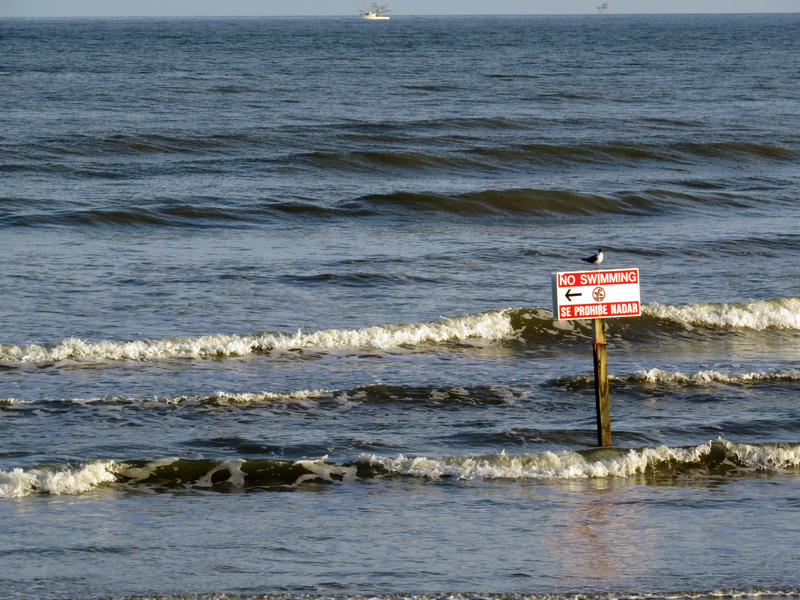 We hope that this information will help reduce the number of fatalities involving rip currents,” said Houser, Associate Professor of Geography and Associate Dean for Undergraduate and Faculty Affairs in TAMU’s College of Geosciences. The survey is available here (https://tamu.qualtrics.com/SE/?SID=SV_e8NBaghB7R7VETr). Rips are fast-moving currents of water that can pull even the strongest swimmer away from the shore. According to the U.S. Lifesaving Association (USLA), rip currents account for at least a hundred deaths each year at U.S. surf beaches. The warning signs and other educational materials and activities, including National Weather Service surf zone forecasts and Rip Current Preparedness Week June 7-13, are part of the decade-long “Break the Grip of the Rip” public awareness campaign by USLA and the National Oceanic and Atmospheric Administration (NOAA). The signs are illustrations designed to instruct people how to escape from a rip current if they become trapped in one, and show the rip from a bird’s-eye view rather than the perspective of someone on the beach. The national online survey was inspired by an earlier in-person survey Houser and his TAMU colleague, Dr. Christian Brannstrom, Professor of Geography, did of visitors to Texas beaches under a grant from Texas Sea Grant. Their study found that the “Break the Grip of the Rip” sign is mainly successful in describing what beach visitors should do when caught in a rip, but not successful in helping beach users identify rip currents from the perspective of standing or sitting on the beach before they enter the surf zone — more than half of beach users had difficulty translating the rip current image on the sign into a feature observable from the shore. Houser and Brannstrom’s suggestions include redesigning the sign to include an eye-level photo of a rip current, adding information about the conditions and locations where rips occur, and listing the visible features that would help beach users identify rip currents. Rip currents can occur at any beach with breaking waves, including the Great Lakes, and most often form at low spots or breaks in sandbars and near structures like piers, jetties and groins. According to USLA, more than 80 percent of the surf beach rescues performed by lifeguards each year involve rip currents. They are not always easy to identify, but signs of rip currents include a break in the pattern of incoming waves; a channel of churning, choppy water; an area with a noticeably different water color; a line of foam, seaweed or debris moving steadily seaward. If caught in a rip current, don’t fight the current directly — swim out of it in a direction that follows the shoreline, then swim back to the shore once you are clear. If you can’t escape the current, float or tread water until the current stops, then swim back to shore; if you are still unable to reach shore, wave your arms and call for help. For greater safety, know how to swim, never swim alone, swim at beaches with lifeguards, and if in doubt, don’t go out. More information about rip currents, including online training to help learn how to spot a rip current, is available at http://www.ripcurrents.noaa.gov and http://www.usla.org. Houser can be reached at chouser@tamu.edu. Texas Sea Grant is a unique partnership that unites the resources of the federal government, the State of Texas and universities across the state to create knowledge, tools, products and services that benefit the economy, the environment and the citizens of Texas. It is administered through the National Oceanic and Atmospheric Administration and is one of 33 university-based Sea Grant Programs around the country. Texas Sea Grant is a non-academic research center in the College of Geosciences at Texas A&M University. The program’s mission is to improve the understanding, wise use and stewardship of Texas coastal and marine resources.